Blog What's going on at Specialcats? The barn, the renewing. What’s going on at Specialcats? The barn, the renewing. We are hands on people. We like grooming the cats, cleaning and caring. Technology, well …. even so, its so good to share all the new happenings here at Specialcats of Ayr. First good news, is we have a new human resident. Patricia will be helping us in the cattery and she is an expert in TLC and cleaning. 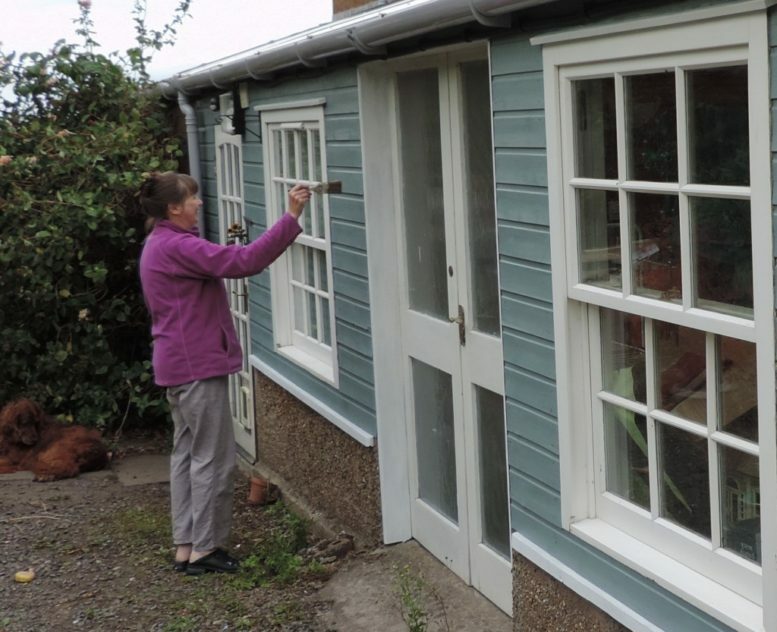 She also likes painting, hence the house’s new look. She is a physical therapist and proud owner of Molly-Bolly, a very loud calico cat. The 2 special needs chalets are up and running. We now have 5 units suitable for those with accessibility needs. The others can also be adapted to suit and will be similarly refurbished in due course. What is different? A low position large interior shelf so cats with weaker legs can feel they are off the ground with less effort; waterproof electrics to allow us to plug in water fountains and extra heat-pads; LED lighting; wider cat-flaps for stiff limbs; larger floor area for the recumbent cat with a low level, energy-efficient glazed window to look out from in comfort. We have added extra polycarbonate sheeting to keep draughts off the runs while still allowing air-flow. The floor has been resurfaced and looks lovely while being easier to clean and dry. Come and see, we will be very proud to show you our handiwork. Re accessibility for humans, well watch this space: November, being a quiet month, should see us making some changes to the driveway and cattery approach. there may be mud, there will be diggers. As for the aforementioned ‘barn’, we now have a large man-shed to put spare men, sorry man-stuff into. Ever since we demolished the old garage, piles of ‘stuff’ have been lurking and breeding in the caravan. Now it can be sorted, re-used or re-homed where suitable. All is good.